Back in 2000, I had a rare opportunity to enter into a year-and-a-half long deity retreat at Vajrapani Institute in Boulder Creek, California. … That first evening I went to see Lama Zopa Rinpoche he had me offer a khata to Ven. Choden Rinpoche, to make that connection. I then followed behind as they walked to the Geshe House. I remained outside the gate, waiting for Rinpoche to return. I saw Rinpoche walking with Brian, heading back to the gompa. The impact was so great: there was Rinpoche on this glowing path, and it came so clear into my mind that Rinpoche is my lamp on the path to enlightenment. He is Lama Atisha. This feeling was so intense. As soon as Rinpoche came up to where I was standing, I immediately dropped to my knees, and offered up the khata. I couldn’t stop crying. I kept saying to Rinpoche “Take me with you; take me with you,” and Rinpoche blessed me. He then removed his zen and flung it on my shoulders. It was so chilly outside, yet Rinpoche wanted me to have his zen. He then headed off with Brian to the gompa. I returned to my cabin. It was late, and I sat on my bed trying to go over what had happened. 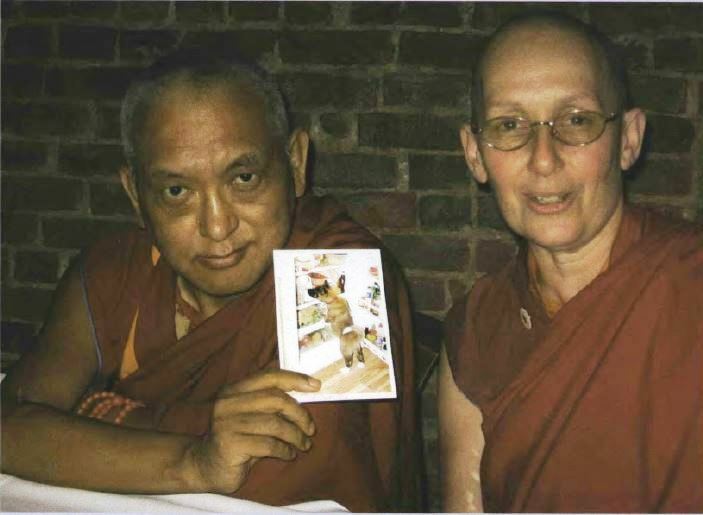 I felt like Rinpoche had given me a teaching on renunciation in those brief moments with him.